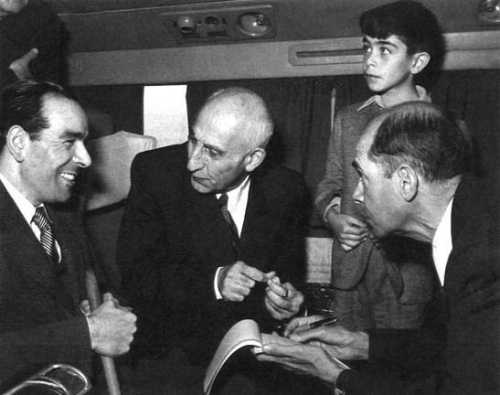 Iranian Prime Minister Mohammad Mosaddegh, overthrown in the 1953 coup. This article was originally published by the Atlantic Council. Sixty-four years on, the effects of the 1953 coup in Iran continue to resonate inside Iran and outside. Last month, the State Department released a highly anticipated official collection of declassified documents covering US policy toward Iran from 1951-1954. While it did not change the basic understanding of that period, it did provide more detail about who was pushing for regime change on both the US and Iranian sides, what they feared and how presumptuous they were. Coincidentally, Iran is nosing its way back into public awareness by means of a number of renewed calls by neoconservative op-ed writers for regime change in the Islamic Republic. In one sense, this is mere coincidence. The volume of documents, part of the State Department’s venerable Foreign Relations of the United States series, has been in the works since the early 1990s. In 1989, the volume that was supposed to be the official word on the coup period turned out not to have a single reference to Western involvement in the overthrow of Prime Minister Mohammad Mosaddegh. Public scandal ensued and the State Department promised to produce a more reliable account. It took more than a generation to accomplish. For several years, US and British government refusal to declassify most of what was in their files held things up. But that was mainly for reasons of spy craft – an insistence on holding onto anything having to do with sources and methods. The British also demanded (and continue to this day) that their part in the coup not be acknowledged at all. By contrast, two US presidents have admitted to America’s role. Hopes for release edged upwards under President Barack Obama – one of the two aforementioned presidents – but his Secretary of State, John Kerry, decided after concluding the contentious 2015 nuclear deal with Iran that releasing records on a topic that remained so sensitive for many Iranians might give hardliners in Iran a pretext to attack the accord. So the Department continued to sit on the volume. In one of the great ironies of this extraordinary political period, it was the administration of Donald Trump – not known as champions of transparency – that finally consented to release the current volume. Officials from different agencies this author has spoken to will not even speculate on the record about the reasons but do acknowledge that it was “surprising” how quickly things moved from the original April 2017 internal memo from the Historian’s Office proposing release, to the mid-June decision to publish. 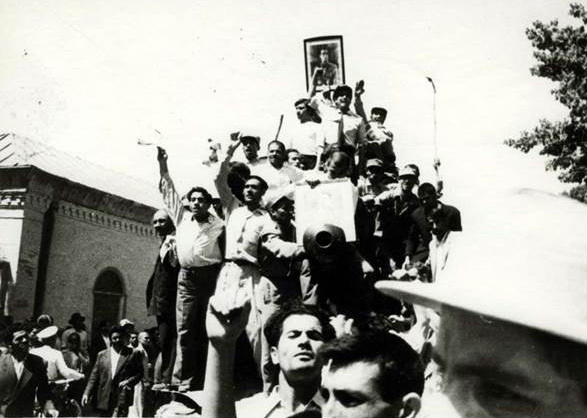 Pro-Shah crowds on streets of Tehran, August 1953. From the comfort of the private sector, speculation is easier. Suffice to say it seems highly likely that, at a minimum, the president, who campaigned on promises to tear up the nuclear agreement, and his secretary of state, who also thinks it is a terrible deal, would not have the same qualms as Obama or Kerry on this score. At over 1000 pages, the volume consists of previously closed files from the State Department, the CIA and the National Security Council (NSC) that complement a small universe of previously known materials on the coup period. Interestingly, the most important known record of the coup, a 200-page internal CIA history written in early 1954, has never been declassified, but The New York Times got its hands on a leaked copy and posted it on its web site in 2000. 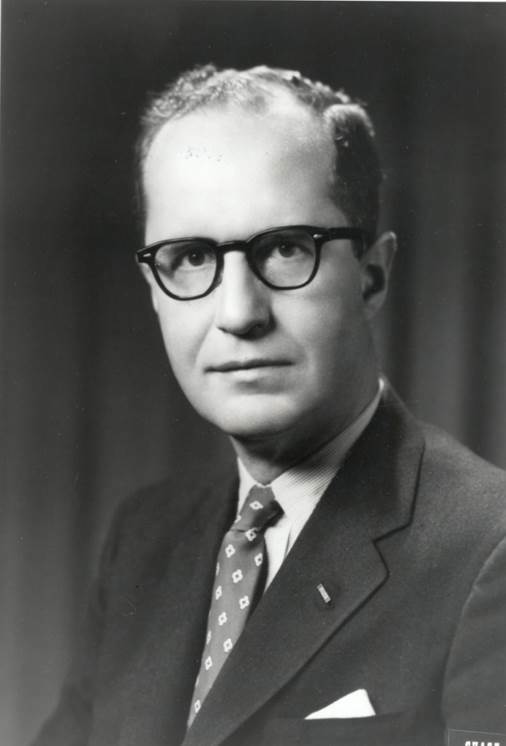 The author of the history was Donald Wilber, one of the architects of the operation. The new FRUS volume contains only one short appendix from his study. Oil nationalization is naturally another focus of attention – since that was the act that started the British, and later Americans, down the road to Mosaddegh’s ouster. The new materials are sure to add to the ongoing scholarly debate over whether the coup was more about strategic fears — the Soviet threat — or crass commercial interests. CIA and State Department assessments also review the actions and thinking of a number of key individuals starting with Mosaddegh but including the Shah, Mosaddegh’s replacement Fazlollah Zahedi and other pro-Shah, military and opposition figures. Particularly interesting are some of the assessments of senior Islamic clerics. Ayatollah Abolqasem Kashani, who was also very active in politics – at one point serving as Speaker of the Majles – appears as someone, in the eyes of the analysts, who has a worrisome capacity to create problems for US policy objectives. American officials variously fret about his forming an “unholy alliance” with Mosaddegh or, improbably, siding with the Communist Tudeh Party. Such was the level of concern at the time that almost any combination of political forces seemed plausible – and all were likely to be bad for Washington. Of course the Tudeh itself appears throughout the files. The Communist threat was uppermost on the US list of concerns, not as high for Great Britain. A few pieces of British analysis pop up occasionally in these records and are useful as points of comparison. For years, the US government has bowed to London’s wishes to keep their participation under wraps. But indications of their involvement slip through. For instance, an editorial note on page 611 reveals that Kermit Roosevelt learned on July 1, 1953 that the British Prime Minister “has approved the plan.” The note goes on to imply, without stating it directly, that the plan indeed has to do with the coup. Here, Wilber’s history comes in handy – it explicitly confirms July 1 as the date Winston Churchill gave his approval for Mosaddegh’s overthrow. As indicated, there is relatively little about the unfolding of the coup itself. Several reporting telegrams are reproduced, some of which include extremely interesting nuggets about events on the ground, and even point fingers after the botched first attempt of August 14-15, although they don’t reveal much about shifting tactics in the wake of that initial failure. Tragically, most of the operational cables for the key timeframe of August 16-19 no longer exist. A source note to the volume explains that CIA officers destroyed a large number of records in the early 1960s as part of a routine “office purge,” and allegedly in the belief that a backup file existed. In fact, a microfilm set had been made and some of the cables in this collection were transcribed from it several years ago originally for use in the 1989 FRUS volume. Where is that backup set now? The source note provides the answer in what may be the most inexplicable statement in the entire volume: “The microfilm was later destroyed in accordance with a National Archives approved records schedule.” How many other irreplaceable files about other historically significant or controversial intelligence operations have met the same “approved” fate? Fortunately, the leaked internal history goes into deep detail about the operation. On the other hand, as useful as that is, there is no substitute for contemporaneous accounts, written or dictated in the heat of the moment, which are the most likely to offer an unvarnished picture of events and officials’ thinking. Wilber, the author of the 1954 internal history, was one of the operation’s planners but was not in Tehran at the time so his account is often one or two steps removed from the immediate action. Kermit Roosevelt, chief of CIA’s Near East operations division, and on-the-ground manager of the U.S.-U.K. coup plan. Some of the most interesting new additions to the story are the notes of meetings that took place after the coup. For instance, Kermit Roosevelt met with senior CIA officials on August 28 and went into some depth about what happened and why he made some of the decisions he did – crucially, refusing to close up shop when it looked like the whole operation had gone south. The volume includes the cable from CIA headquarters advising Roosevelt to evacuate his team. Instead he stayed in Tehran and worked with a number of Iranians to put the operation back on track. One of the questions about this episode that has gotten significant play in recent years is whether the coup was an American and British venture or whether Iranians were the ones who ultimately pulled it off. Not surprisingly for such a significant – even emotional – issue, opinions are sharp on all sides. Already, “I-told-you-so” articles, web postings and interviews have appeared, insisting the new materials conclusively support a given interpretation. More information does not always bring greater clarity. The fact is that the full story of the coup will never be told, at least not to everyone’s satisfaction. No significant troves of contemporaneous Iranian documents are likely to appear after this long, although one can always hope. The British government refuses to open its undoubtedly rich archive to public scrutiny. A large collection of Tudeh Party materials is under lock and key in the Moscow archives. When this author asked the head of one those archives some years ago about getting access, he was told he would need the Tudeh’s permission. Even the American records – the ones that still exist – have not fully been released although we’re getting close to the bottom of the file cabinet. At least nine CIA records that didn’t make it into the volume are specifically identified and marked as “not declassified.” Over 100 more that are included have bracketed text indicating where security deletions have been made. So, the debates will continue, but they will now be a bit more informed, at least on the American side. Meanwhile, my organization, the National Security Archive, has begun filing Freedom of Information Act requests for the expurgated materials.